Fall fashion might already be making its debut in stores and fashion magazines, but that doesn't mean that summer temperatures are gone yet! Continued weeks of hot temperatures and high humidity here in the South have me craving beach days. Unfortunately, my current schedule is based around broadcasting school, blogging, my second part-time job, and a new internship, so I haven't had much time to spare on weekdays for anything beach related. (More importantly, nor is there even any ocean within day-trip distance from Charlotte!) However, I like carving out some pool time on weekends to satisfy my sunshine and water cravings. This adorable pom-pom swimsuit cover-up is perfect for end-of-summer beach days, or any warm weather fall vacations that you might have coming up! The back with the pom-pom detailing is so unexpected and fun. The best part of all is that it's under $20- a deal that absolutely can't be beat! 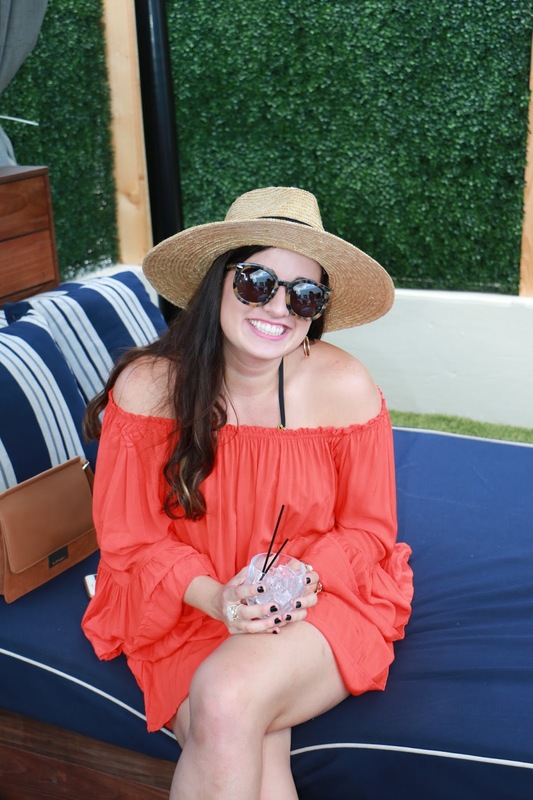 I wore this pool outfit this past weekend, when the InfluenceHer Blogger Network's Charlotte area group held our biggest summer meet-up! I am the regional chair for the IHC in this region of NC, so I get to have the fun task of planning our meet-ups. We've already had some very fun ones this year, including meeting for brunch, a girls' day of outlet shopping, and exploring a botanical garden, but for this meet-up I wanted to try something different and partner with a venue! 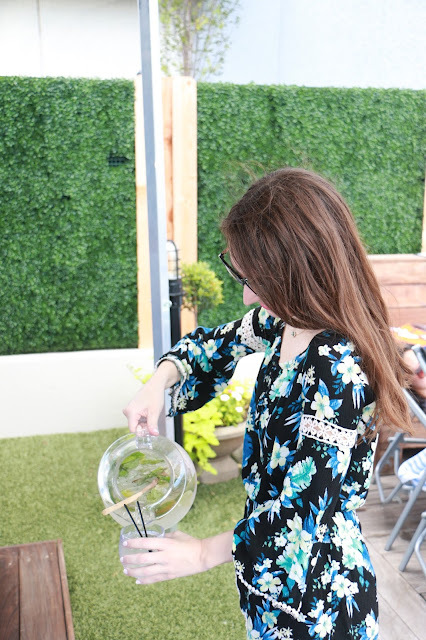 None other than my favorite destination for Charlotte summer fun, Craft City Social pool and day club (located in the Sheraton Hotel in Uptown Charlotte) was happy to partner with us, and they helped me plan out the perfect day of poolside fun for some of my favorite local blogging besties! Craft City Social treated us to an afternoon in one of their comfortable poolside cabanas, and also provided delicious food and drinks! Their menu features a large variety beer, wine and cocktail selections, as well as a Latin-inspired small-plates and entrees menu. Dana and Chloe decided to try the Cuban sandwiches for lunch, and I ordered early enough to still select from the weekend brunch menu. 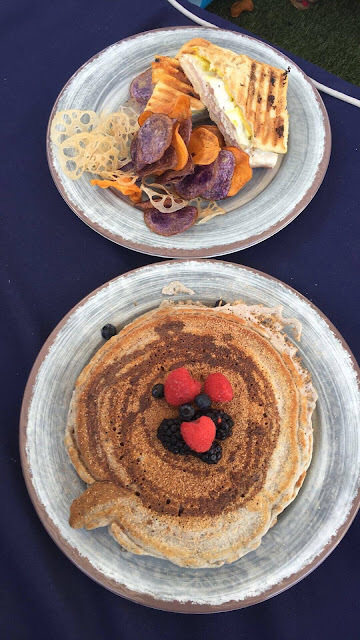 I went ended up enjoying the blue corn pancakes which did not disappoint! 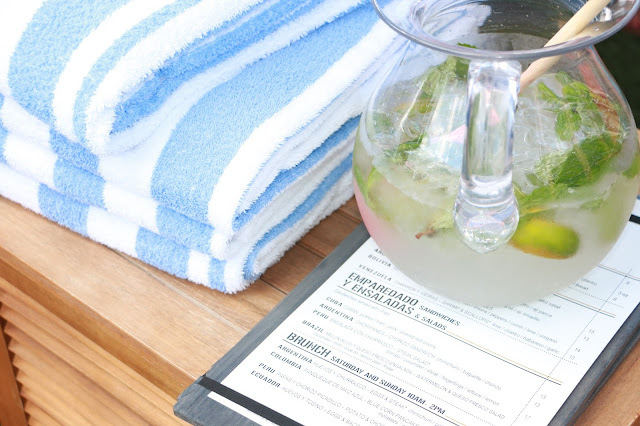 We all decided on two beverages from the pitchers menu: the lavender mint mojito and the white peach, grapefruit and basil sangria. I honestly don't know which drink I liked more- they were both outstanding! Our afternoon was filled with sunbathing, pool time, and of course an equal mixture of girl talk and blog talk. In attendance at this month's meet-up were Amy of Pastel n Pink, Cara of Caralina Style Chloe of A Queen City Girl and someone who was visiting me in Charlotte for the weekend- my Tennessee blog bestie Dana from Seersucker Sass! Thank-you to Craft City Social for having us this weekend, and for helping to satisfy my beach and sunshine cravings right here in the middle of North Carolina! Make Me Chic and Craft City Social provided gifted product/experiences for this post. All opinions are honest and my own. 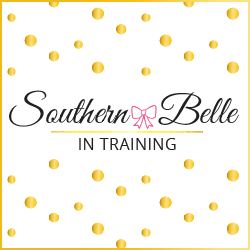 Thank-you for supporting the brands and businesses that support Southern Belle in Training! Absolutely love your coverup, Annaliese!! So adorable :) Hope you are doing well! This looks like such a fun girls' day at the pool! A perfect meetup idea for the summer! Looks like you girls had so much fun! that cover up is too cute! What a fun cover-up - so cute! And it looks like the blogger meet-up was a blast! Only the cutest beach coverup ever!! Looked like a blast girl! You are the cutest! 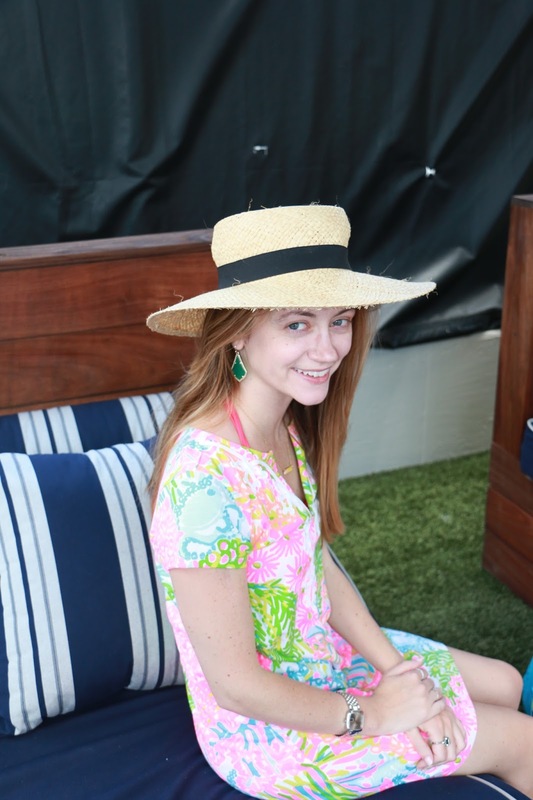 This cover-up is so fun, perfect for this event! What an adorable cover up, in love! That pom pom cover up is super cute, looks like you ladies had such a great time! You are the cutest! I became obsessed with this cover up the moment I saw it on your instagram! It really is the cutest cover up! Such a cute coverup!! All you ladies look fantastic, sounds like you had a fun meetup! So cute! I love your coverup! Perfect for summer! Your cover up is the perfect piece to rock the pom pom trend! 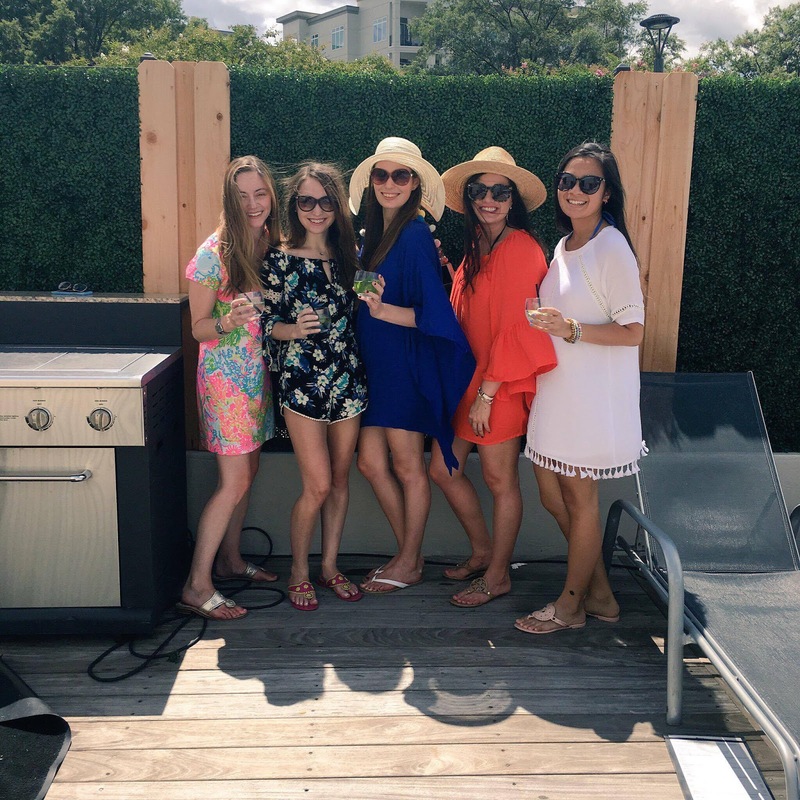 It looks like you ladies had a wonderful time! This pom pom dress is so adorable! Perfect for poolside fun! I was so excited to hear about this!! Loved following along on your Instagram. Nothing better than a blogger meet up. 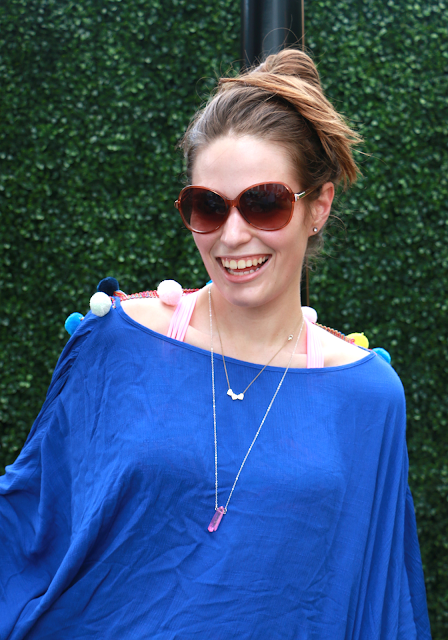 Love the pom-pom cover-up! Too cute.